The further ahead you look - the faster you go | davidpcushman AT gmail.com | These are my views and my views only. Subscribers to ADMAP magazine's June issue receive a three-page article on each of the 10 Principles of Open Business - and there's a front page mention, too. I'm afraid ADMAP don't allow sharing of their articles. 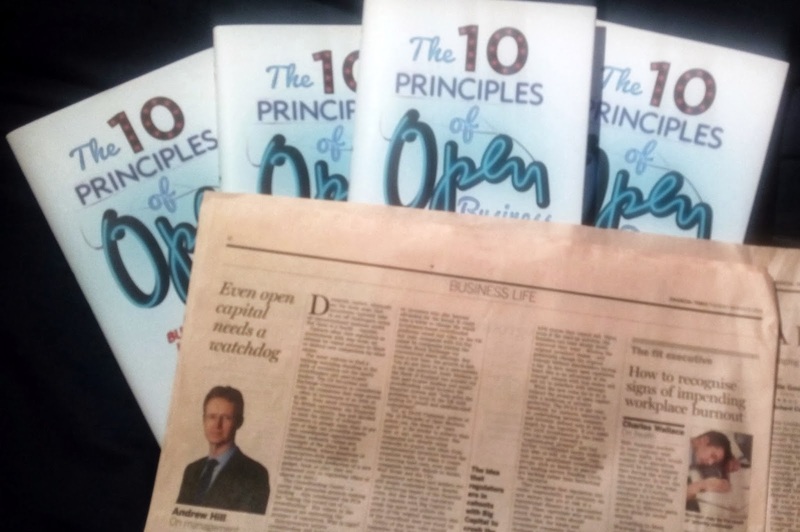 The Chief Learning Officer at global PR business Ketchum wrote an article/review on The 10 Principles of Open Business for the Ketchum blog on April 8 (2014). In his post The Purpose Driven Organization - Moving from Talk to Walk Robert Burnside concludes: "I highly recommend you check out the thinking in this book. It's ahead of the curve and a useful glimpse into the future." B2B Marketing Magazine published a review of the 10 Principles of Open Business in its April 2014 issue. Cambridge Business Magazine published a three-page interview with me about The 10 Principles of Open Business in its April 2014 issue. You can view an e-magazine version here. The article starts on p58. It's flash so no use for apple devices I'm afraid. And on Tuesday (March 11, 2014) Financial Times readers found a reference or two in a column about crowd funding by Andrew Hill (it will be online the evening before). What was particularly gratifying about the FT column was its emphasis on Open Capital over crowdfunding - in line with the book and its principles. Here's a link to the result of an interview conducted with me about Open Business by The Irish Times. Extract: "Openness is not just a nice to have corporate social responsibility virtue but is a vital element in 21st century organisations. While born-digital ventures, for example, instructively know this, all organisations need to move to this model quickly if they are to survive in the networked age." For the full article (as it also appeared in print on February 24, 2012) go here. Brand Republic ran the press release about the book pretty much as is on February 3, 2014 (read it here) as did another magazine in their group - which I've lost track of, sorry. The Cambridge Evening News' Business Magazine ran an article on The 10 Principles in its latest issue - March 2014 (give them your email for a free e-edition here) . And, for the record... .SO magazine ran a double page spread in their autumn issue of 2013. Find that online here. Other stuff in the pipeline includes an indepth article in the April issue of Admap and an article on the theme of sustainability through Open for The Guardian. The rate of change is so rapid it's difficult for one person to keep up to speed. Let's pool our thoughts, share our reactions and, who knows, even reach some shared conclusions worth arriving at? What's your Customer Referral Value? Will we meet in March? Should we code humanity into evolution?